south of downtown San Diego. sofa , there is also a crib for the little one. This condo will sleep up to 4 adults, and 2 children It has all the amenities of home and parking for 1 car inside a garage. on and watch the sunset, or fish from, Imperial Beach is hard to beat. have your own bar-b-que on, and of course the beach is right there. famous attractions such as Sea World ,San Diego Zoo, Mission Bay, Balboa Park with it's numerous museums, old town, and seaport village just to name a few. Summer month rentals need to be from Saturday check in to Saturday check out. During the Off peak rentals need to start on a Saturday. We liked the condo’s proximity to Imperial Beach (you can walk everywhere) and it was fairly quiet there. The kitchen was adequately furnished. We only choose rentals that have a king bed so that was a plus for us. It was nice to have a garage to use. But there was no mattress cover or pad (not sanitary!) and the king fitted sheets don't fit and come off the ends. The sofa and chair are very uncomfortable and need replacing. Overall we enjoyed our stay. Very Nice home away from home! This is a superbly located accommodation with everything close by, the property is spacious clean and comfortable. Kitchen utensils and amenities could do with an upgrade and the bathroom is very dated with hot water running out after 15mins so for larger groups like ours it was quick showers! But we had a very pleasent stay and would definitely recommend. Thank you Sherise for your kind review. We are in the process of getting things arranged to update the bathroom. This has been something we have been meaning to take care of. We do appreciate you mentioning about the hot water. We will have someone check out the hot water heater. Glad to hear that you enjoyed you stay. 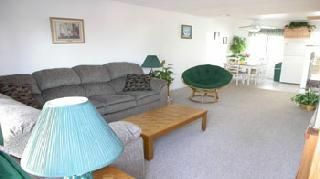 Great condo in a great location. It could use a couple updates....couch cushions that actually stay on the couch and fitted sheets that fit the bed. Location is everything. Jogging on the beach, 3 blocks to the park for the kids. Pizza, seashells and seaside candy store. All really great. Place had basic cooking utensils and supplies. Only complaint is the carpet is a bit grubby. Otherwise, great spot! We had a great time at a very well located condo. Equipped with everything you need and more. Thank you for your kind review, we are glad that you enjoyed your stay. We had such a great time playing at the beach, this condo had such easy beach access. It was just what we were looking for! The owners were very friendly and easy to work with. Summer month rentals need to be from Saturday check in to Saturday check out. During the Off peak rentals need to start on a Saturday.